AMHERST, Ohio (CNS) — The foot-tapping melodies of Polish-style polka music that greets patrons as they enter the Kiedrowski family’s bake shop says that old-world hospitality is at hand. The upbeat music, owner Tim Kiedrowski says, is meant to evoke the memories of traditional food, family customs and church life. 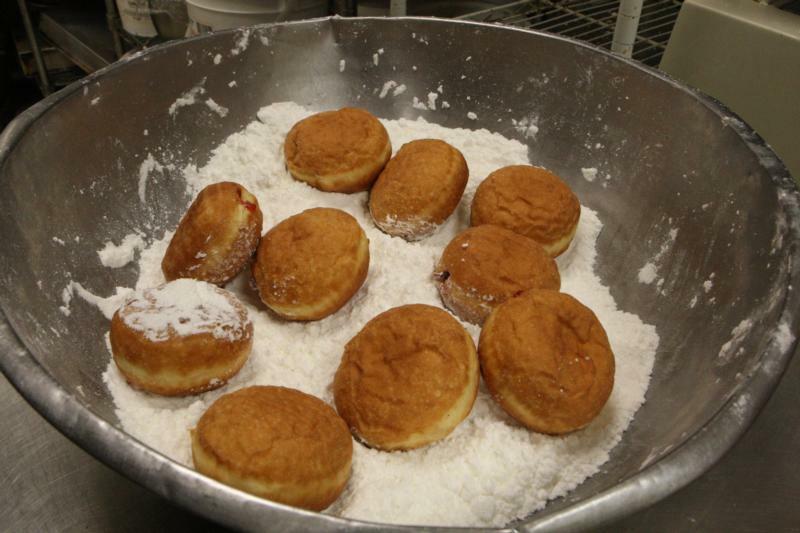 And in the days before Lent, there’s nothing more traditional at Kiedrowski’s Simply Delicious Bakery than delectable paczki — pronounced poonch-key in Polish — deep-fried sugary doughnuts that taste like what Mom and Grandma used to make. Tim and his wife, Terri, both 60, said the dougnuts served up in the days before Lent, like the sweet treats and breads prepared in their bakery throughout the year, are based on family recipes handed down from generation to generation. It’s the tradition of the not-so-fancy paczki of which the Kiedrowskis have raised the profile in ethnic-rich enclaves 30 miles west of Cleveland while helping Polish-Americans keep in touch with their roots. Tim recalled coming home from St. Stanislaus School in Lorain, not far from the bake shop, and seeing his mother standing by the stove frying airy paczki. He would help by sugaring the doughnuts in a bag. There is no official history of paczki other than one rooted in the deep Catholic faith of Poles. In the days before the Lenten fast, peasant Poles wanted to use all of the fats, sugars and dairy products on hand. While many Catholics might celebrate Fat Tuesday and Mardi Gras revelers party for several days, Poles traditionally started the pre-Lenten feast six days before Ash Wednesday. “In old time Poland, the rich folks would celebrate on Thursday (before Ash Wednesday) and have the meat, the fish and the good wine,” Tim said, seated at a work table where plump mounds of paczki dough were rising. “But all the peasants, the poor, would have whatever they could, pickled herring, fats, dairy. Everything was to eat has much as you can to help you face the sacrifices of the Lenten season. Terri, who grew up in a German Catholic family, said such customs keep families together. For the Kiedrowski family in Lorain, an industrial city that rapidly grew in the early 20th century with an influx of European immigrants — thousands of Poles among them — Lent meant no sweets, mostly bland food, no meat on Wednesdays (in addition to fasting every Friday) and plenty of prayer, highlighted by weekly attendance at the Stations of the Cross at their parish, St. Stanislaus. The focus on paczki at the family-run bakery came on a whim. The couple officially took ownership of Simply Delicious Bakery in downtown Amherst in November 1984 after negotiating a deal when the original vendors declared bankruptcy. Tim, with some baking experience after high school, had been working at the bakery after being laid off from his job at a Lorain steel mill. Terri’s work as a nurse was taxing because of the long hours she put in to support a growing family. Before long, the couple realized they had to make the bakery stand out and they turned to paczki, a favorite treat that recalled Polish heritage. “I grew up in a very strong Polish household,” Tim said. “So I wanted to incorporate a lot of my mom’s and Grandma Kiedrowski’s recipes. They declared the days before Lent in 1985 as “paczki time” and came up with the slogan, “Taste the memory in every bite.” The couple hoped to sell 25 dozen sugar-shrouded doughnuts. “We sold the first 25 dozen within the first three hours. 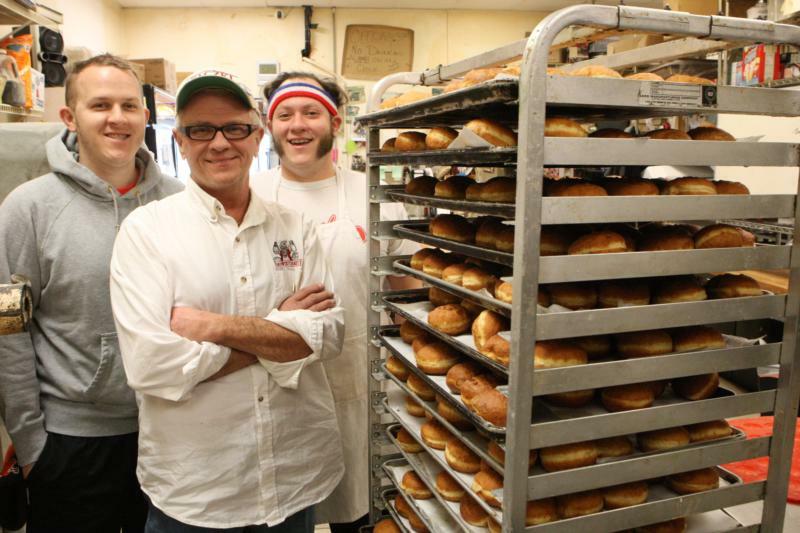 We advertised we were going to have Grandma Kiedrowski’s Polish paczki, which led me to believe that there was a lot of interest in memories,” Tim recalled. With that success, a year later the Kiedrowskis expanded their line to include paczki filled with lekvar, or cooked prune. A few years later they added apricot and poppy seed fillings after hiring a Polish-born woman to work in the shop and she told them of some of the types available in her homeland. Seeking to bring new twists to their line of ethnic goodies a few years later, Tim was looking through his mother’s recipes when he came across one for rose petal jelly. He wanted to try it in paczki. Sales “skyrocketed” after the flavor was introduced in 2003. In 2015, the bakery produced 85,000 doughnuts out of a small, almost cramped storefront, distributing them as far as Youngstown 90 miles away. These days paczki time starts about three weeks before Lent and ends a few days after Ash Wednesday. On Fat Tuesday, customers line up early as Ed Klimczak, a local polka band leader, greets them with traditional tunes on his accordion and Tim offers shots of Polish vodka to keep folks warm. The Kiedrowskis also have some fun with the mouthwatering paczki. Since 1998, the bakery has put on the Paczki Ball, at which there is the “unveiling of the paczki.” Traditional Polish foods such as stuffed cabbage and noodles, pierogi, and sausage and sauerkraut are served, and Klimczak’s band provides the music for dancing. It has sold out 19 years running. Tim and Terri are passing on the ethnic and religious customs to their four sons, two of whom, Michael, 33, and Tim, 31, returned to work in the bakery after starting careers after college graduation. “The kids love tradition,” Terri said. “They say, ‘We have to do it this way.’ It’s getting lost with a lot of families, particularly when they are moving away from religion and what we know. It’s such a big melting pot in the United States (that) it gets difficult to keep that together.